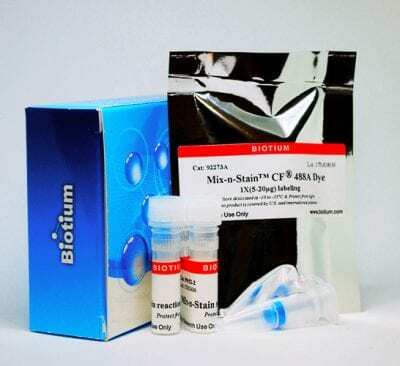 Mix-n-Stain™ antibody labeling kits are a revolutionary antibody labeling technology that allows you to label your antibody with biotin or one of our superior CF® dyes in 30 minutes without a purification step. The labeling procedure tolerates many common buffer components and antibody stabilizers. Choose from kit sizes to label 5-20 ug, 20-50 ug, or 50-100 ug of your antibody. For more information and guidelines for selecting a kit size, please download the Mix-n-Stain™ flyer and the product information sheet for this product. This kit is for labeling an antibody with the traditional green fluorescent dye FITC. For a green dye with superior brightness and photostability, see our Mix-n-Stain™ CF®488A labeling kit.